Words by Tom Stickland with thanks to Chris Killer for reviewing and allowing its use. Read the victim’s story. Also look at our article about accident statistics and safety gear. 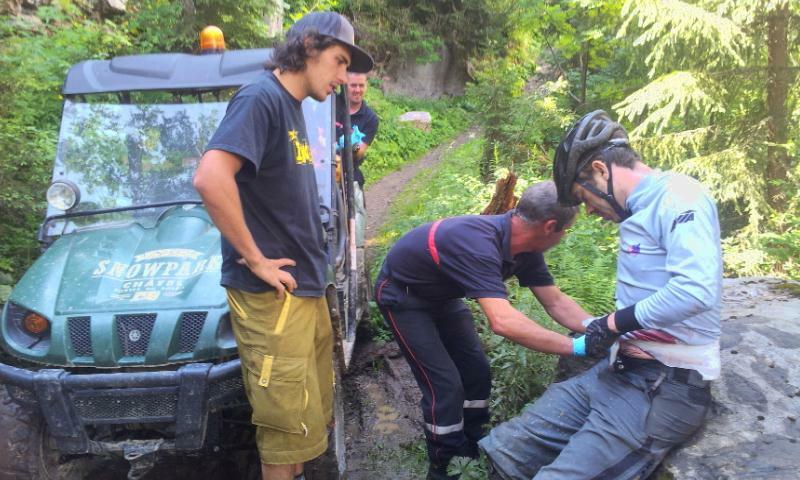 I’m writing this as a first person account of a mountain bike accident that happened in the French Alps. The victim suffered a lot of pain in order to make this real life training exercise happen, so I’m keen that we learn as many lessons as possible from it. It was certainly a light bulb moment for me. If you want to save time then skip straight to the lessons. I’ve been riding for well over ten years and in the early days it was a lot of easy trails. We didn’t carry first aid kits and the chances of an accident seemed tiny. I didn’t even think about it really. Overall I’ve probably seen about fifty crashes where the rider gets up laughing with the only damage to their bike or their pride. More seriously I’ve seen a rider fall down a set of steps head first, crack open a helmet, break some teeth but essentially not much else. I’ve seen an experienced downhiller ride the same obstacle six times and then, on the seventh, catch it slightly wrong and plunge headfirst down a steep slope and hit a tree. The most bizarre accident was a rider who broke his collar bone in a grassy field. A very minor fall after his wheel caught a buried log caused an unlucky landing on his shoulder. Thinking of my own accidents I’ve been very lucky in avoiding them. I’ve vaulted over the bars feet first on a few occasions. I think the worst outcome was going over the bars on the Real Ale Wobble one year and the bike following and hitting me on the head. 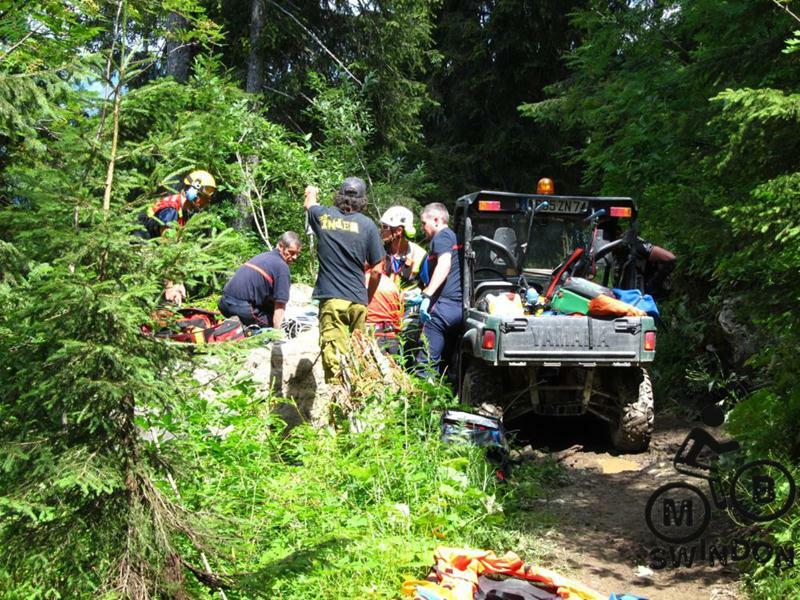 If you ride a bike off road and want some adventure then you have to accept that there are some risks and eventually you or someone else will end up in a “situation”. There are many things that you can do to prepare for this and doing any of them will significantly help you out. Accidents can happen when you least want them – when it’s late in the day, you’re not quite sure where you are, you’re running low on food and you’re knackered. 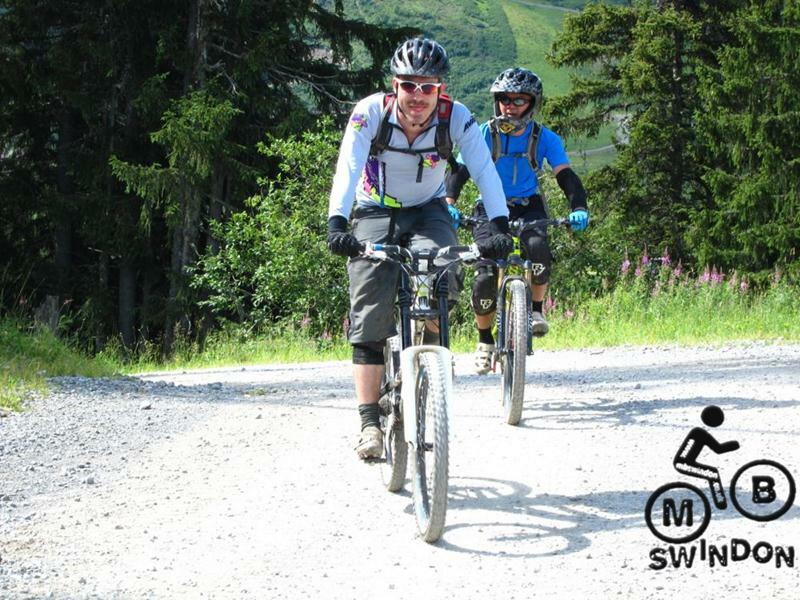 It was the second week of our alps trip and we had a mixed group of riders staying in Morzine. We’d all been busy riding the trails in the area, some groups doing serious downhill trails, others developing their skills on the easier blue and red trails. It was all free and easy with different riding partners going out each day to do whatever took their fancy. Four of us decided to have a technically easy day and cover some distance doing what we called “Pass’portes Lite”. This was a cut down version of the Pass’portes event route and gives a tour of the mountain (see photos from 2012 including the Pass’portes event). 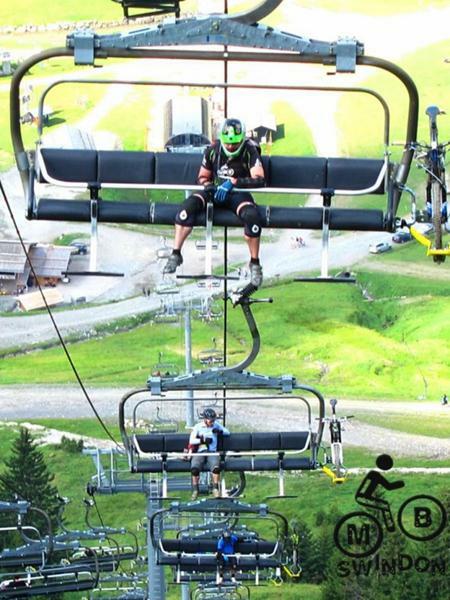 Our day out would involve a big trip from Morzine to Chatel and then back via the Swiss side. Three of us knew each other well: Gary, Jerome and myself regularly did races and epic rides together. Part of the fun a social club is riding with new people and Chris was new to us on the holiday and we’d ridden some trails earlier in the week. The previous day he’d been out doing gnarly dh trails and was liking the idea of an easier day. 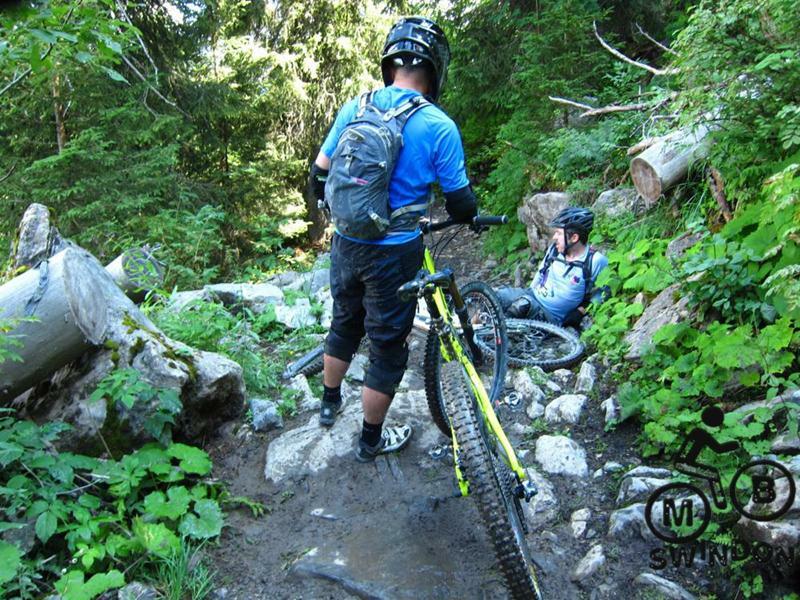 We followed the well established route up lifts to Super Morzine, traversing and descending to Les Lindarets, another lift and then a bit of a laugh round the green trail to the Chatel bike park. We made ourselves light headed racing up the fire road climb and laughing that we’d overtaken a cross country rider who’d got the hump and caught us up at the top. Not long later we joined the single track path that follows the cliff edge round towards Chatel. I was last in the group and noticed that the rocks on the path were quite slippery and had a tendency to rail road the bike into wheel sized grooves. I didn’t think too much of it – I’d ridden this route several times before and knew that it was easy enough. I was thinking about the next sections where it got steeper with a bit of fence a big drop to the left. I took a look and the side of his shirt was already very red. He lay on his side and I lifted the shirt up and there was a lot of blood. I realised straight away that a large rock must have cut into him – we’re talking about a cut that was several inches long, and an inch or so wide. The rocks stuck up by several inches so it could have been that deep too. Blood was shooting out at regular intervals. I said something like “Chris. Lie there. This is quite serious. I’ll get my first aid kit out. I need to bandage up this cut”. He was very calm about it – I think the early shock had left him numbed to the pain. 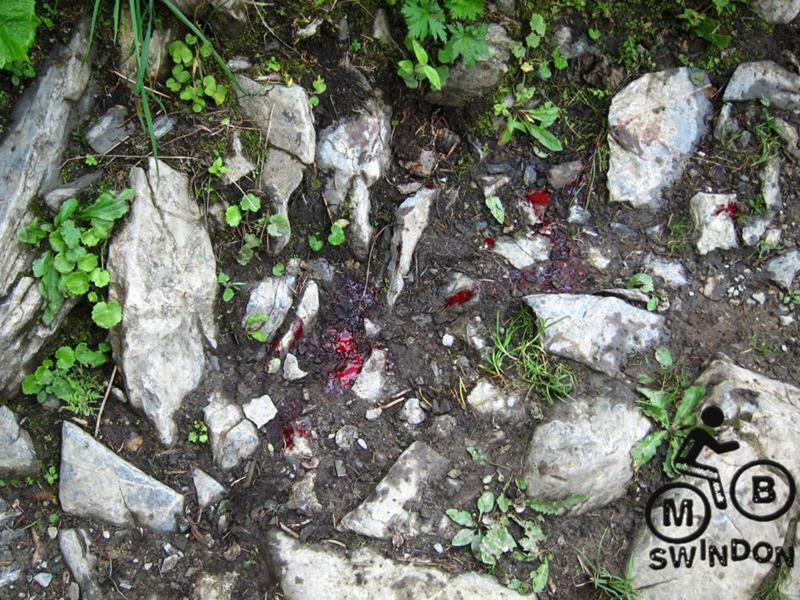 There were some German guys riding the same trail and they produced some antiseptic fluid which we chucked on before applying the bandages. I have to be honest here – the first aid kit hadn’t always come with me on rides and it had been treated a bit as a token gesture really. Luckily it contained a massive bandage that was about the size of a pillow case. I did get a bit distracted showing Gary and Jerome where we were on the map. They were tasked with calling for first aid help and riding out towards the large track where we expected help to arrive. Luckily I’d ridden this route several times before and studied the map a lot so I knew the lie of the land well. Two of us helped Chris move from his lying position, walk a few steps on one leg and then sit on a rock. We were now into a slightly different phase. It was very quiet. No help had arrived yet. Chris was in a lot of pain but he was strong – the only sign of the pain was an occasional short breath. Still in early stages of shock he said “this will be my last ride this week”. Him, myself and the three German guys talked a bit about what had happened to pass the time. The analysis started: “I was probably going a bit too fast and my saddle was too high. All my speed went into hitting that rock. I think I’ve broken something – my side really hurts.” I was hoping that it was just a lot of bruising. 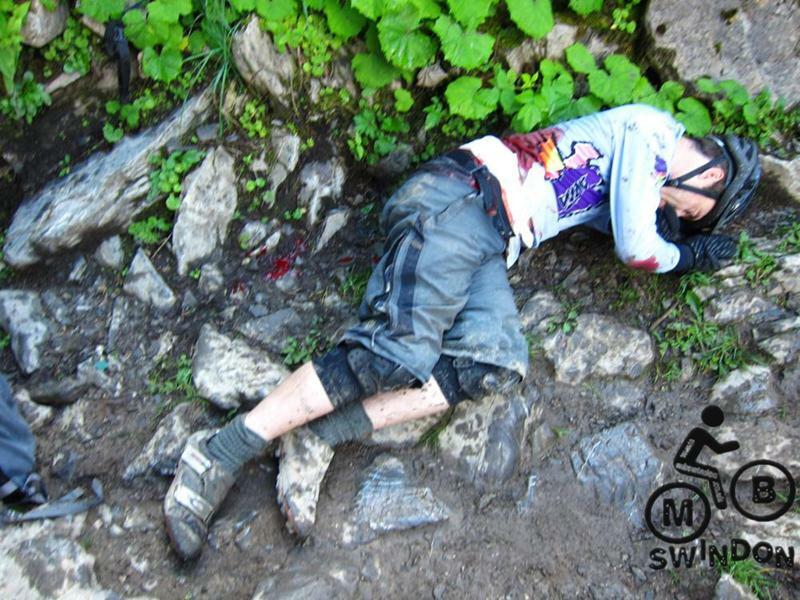 I said “It’s easy to blame yourself for an accident but mountain biking contains risks and you’ve had some bad luck”. Anyone can be wise after the event – after a difficult day, Chris was in a relaxational mode and possibly slightly underestimated the risks of an easy looking section. But so would I – I’ve ridden this before and never really thought about it. It’s just a rocky section on a path. I also know that sometimes some speed can carry you over something and make it easier. Chris said the pain was quite bad in his side and asked if I could sit on the rock next to him so he could then support himself with an arm round my shoulder. I moved into position and grabbed his left arm and held onto it. It was a sunny day but we were under the trees and we were wearing kit for sweaty riding. My body heat helped keep him warm. It went quiet. There wasn’t much to say. I strongly remember the smell of blood and flies having a bonanza. Time ticked by very slowly. “How long until they arrive?” asked Chris. Of course I didn’t have a clue but I hoped it would be very soon. I had to keep calm, keep him calm, think of something realistic, not get hopes up but also not be too downbeat. “Twenty minutes I reckon”. Time continued to move very slowly. I focussed entirely on my breathing. I wanted to be very calm. I wanted the casualty to be as calm as he could be. There was nothing else I could do. We heard a siren down in the valley which was promising. A call on my mobile from Jerome said they were bringing the quad bike along the track. We continued to wait. After another ten minutes we heard help arriving. It was a quad bike buggy with a roof on it, driven by a lanky French youth and accompanied by two burly looking pompiers (fire fighters). Their put a heart rate monitor onto Chris’s finger. The main contribution this seemed to be make was beeping continuously. They removed my bandages and pressed some new, bigger ones into place. Chris went a bit quiet when they pressed on these. Then they messed about with a neck brace “this neck brace is totally pointless” he said. They decided that some gas would be good too. They told us that the air ambulance would be used to transport him and it would take some time for that to arrive. So we had a lot more waiting to do. The German riders asked if there was anything else they could do and we said no. So they carried on with their ride. Chris asked for some water, which we gave him. The pompiers were not happy about this. They moved the buggy closer so Chris could rest his feet on it. I had to help him move his feet. I was not injured and I found the sitting position quite hard to maintain. I was just very aware and grateful that I wasn’t the injured person. I said “You’re doing really well Chris”. We waited. The lanky guy wandered off and lit a cigarette. The pompiers wandered around a bit, fiddled with the gas, asked us how it was going and talked into their radios. “Another 10 minutes” they said. We waited more. Chris was cold. They wrapped a blanket round us. “I just want to lie down” he said, “I feel really tired”. We heard the faint sound of a helicopter and the it got louder and louder before we saw it over the hill. The helicopter came closer. We had more waiting to do whilst the pilot did a recce of the wooded area. I presumed that it was a risky business with so many trees and a steep mountain. The helicopter came closer and the downdraught blew any debris up into our faces. We had to close our eyes and look away. The noise and draught went on for 30 seconds or so and then receded. Suddenly there was a paramedic. It was rather like an alien encounter. On the next helicopter approach I took a look through the draught and saw that they were winching the paramedics down. We soon had three paramedics there as well as the two pompiers and lanky driver. A small woman said “the pain, how is it? Zero is none, ten is bad?”. “Eight” said Chris. She was soon busy with tubes and needles. At this point the pompiers indicated that I’d finished my job so I moved away to a safe distance. The team of five were busy for a long time – possibly half an hour as they had to get Chris from a sitting position into a lying position. Jerome came over and told me that it was looking bad – a lot of blood had come out during the move. I had the feeling that it was a risky time. There’s some major arteries near the pelvis and a lot of blood loss could be very serious. I was worried but there was nothing I could do apart from hope. 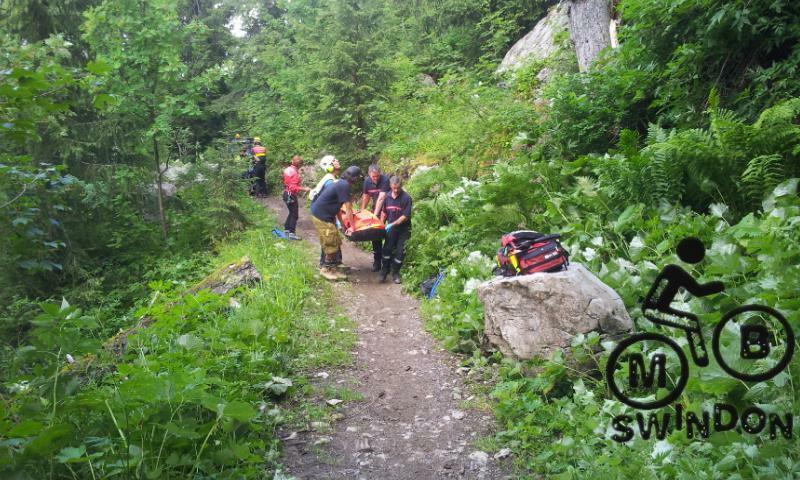 Finally they moved the stretcher onto the path, the helicopter winched two of them away and then the last paramedic and the stretcher. The pompiers finished their clean up and disappeared. Just another day for them. Just another day for the helicopter too. Then it was quiet. We inspected the rocks. The pompier cleaned congealed blood off the sitting rock. We made plans for moving the bike and kit back to the chalet. We had everything including his phone. Our only contact was that Jerome had given his number to the paramedics. Our first riding was quite tentative – when you’ve seen a lot of blood you tend to feel a lot more vulnerable. However, the risks hadn’t changed. After we’d dropped the bike off at Les Lindarets were ascended super Morzine and Jerome and myself ended up doing a very steep and rocky descent down through the trees (not the standard route). I think we had to get ourselves back into the groove of riding before we lost our nerve. Back at the chalet we had more work to do. Contacting family and girlfriend. I had his phone but it seemed to have no telephone contacts on it. I managed to contact his girlfriend via Facebook and then she phoned me. It took a day before the message had reached everyone who needed to know. 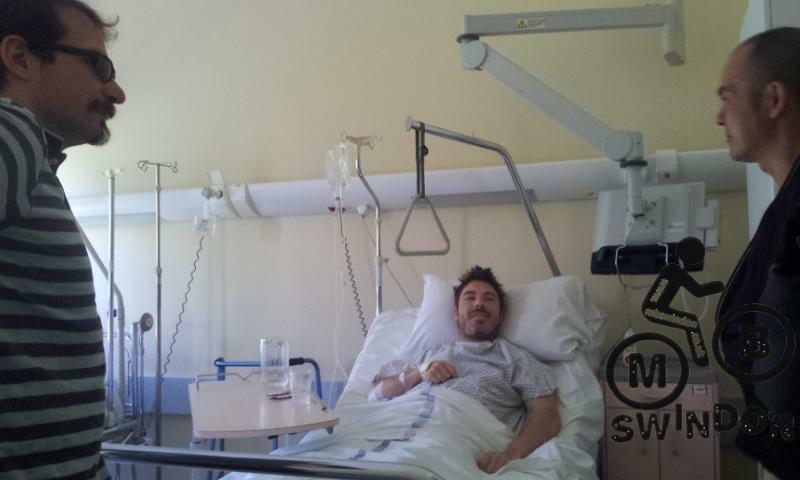 We also had to contact Snowcard insurance, then the hospital and sort the plan for moving kit back to the UK and also visiting and delivering essentials to Chris in hospital. He’d been moved to Annecy. We heard that he had fractured his pelvis – he was right about the break and they’d plated it. 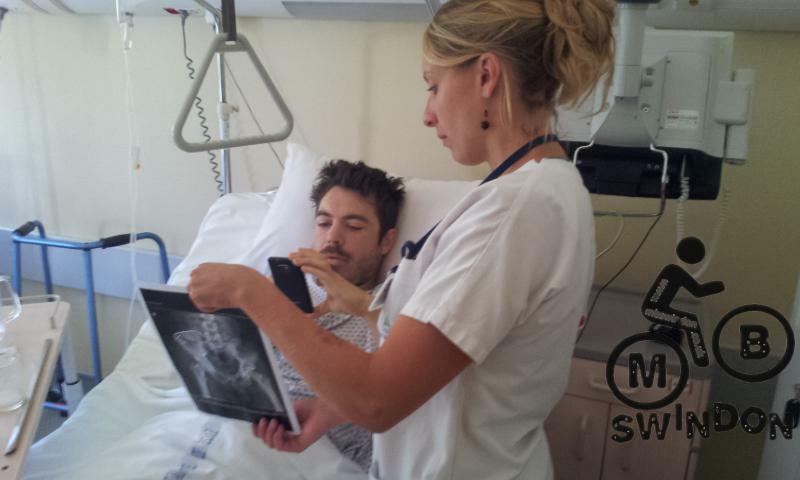 We got to visit Chris three days after the incident and he was in a stable state in a ward with a very nice nurse. A little bit of simple preparation can make a massive difference. You don’t have to be far away from civilisation to be a long away from help. A few hundred metres of singletrack in a forest is enough to make you remote. Even an easy, local ride can turn into a serious situation if you are unlucky. In a real life situation you will have to do the best you can based on experience, common sense and any training you’ve received. There might be a lot of time waiting for help. I’ve broken every combination of the list below over the years and thought nothing of it! Consider a situation where you’ve gone on a exploratory ride on your own, you didn’t bother telling anyone where you were going, it’s getting dark, you’re a bit lost, there’s no phone signal, you left the first aid kit behind and then you fall off after slipping on a root and cut your leg badly on a rock. Ride in a group if you can. If alone then let someone know what route you are taking. At least a search party can start out with an idea of where to look for you, but expect it to take hours. Try to keep track of your location and have an idea where help might be. A map is very useful. Carry a mobile phone and don’t flatten it using strava. Carry a whistle and head torch so you can be located easily. Ensure you have enough food and water (this is general good practice anyway). Consider carrying a survival blanket as well as some spare clothes. Don’t feel bad about walking or avoiding an obstacle, especially if you’re not quite “in the mood for it”. Do some first aid training – you will really appreciate it when you need it. Have suitable insurance when outside the UK. A really good read and Chris i hope your on your way to a full recovery. I too had a few incidents over the last year that has made me assess what I carry on the trails. When i first started biking I used to carry a full first aid kit, food, and basically everything bar the kitchen sink! Over the years though, I fell into bad habits and being tight with weight so the safety stuff got ditched. This is a wake up call hopefully not just for me, and proves that anything can happen at any moment. You cant be prepared for every issue, but if you have the basics, it will make for an easier experience. I have just got back from a trip to Whistler….with 2 broken ribs and a whole bunch of cuts/bruises..
My first aid kit, spare food, and a spare phone battery is now in my pack!! That advice is all so true – it’s so often the case that the inocuous incidents turn into the biggest epic. Last July (2013), on our second spin round Verderas in the Forest Of Dean, I came a cropper – by rights I should probably have walked away from it, or more likely fractured a wrist, but as it was I ripped by chin apart and compressed by neck. It was only having the support of two excellent mates, who remained remarkably calm, and the decisions made initially at Dilke Minor Injuries that stopped this a fraction short of being life-changing – I’m back in one piece now, but still have no feeling in my chin or index fingers. I’m the one who carries a first aid kit and you can’t cover all eventualties – so I work on the principle that an injury is either a scratch that needs patching so that a ride can continue (comes of having kids) or is a bleed that needs stemming while the helicopter arrives, anything in between should be manageable. Therefore, my little first aid pack is a tiny trauma pack with lots of sterile pads for the latter. 5 year feedback from the injuree himself! The affect this has had on me, maybe 500 rides later, is to think deeply about what it is I’m getting into. I factor a lot more into my decision making nowadays. 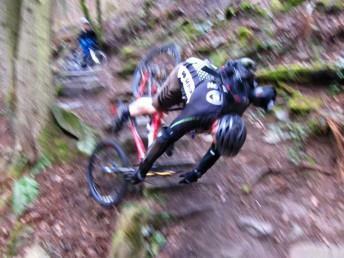 I bought a dropper post shortly after this crash. I moved to Southern California, where it goes without saying that everything will be dry. I never run my tyres above 25psi. I got a larger framed (and wheeled) bike. When planning a challenging solo ride, I make sure it is no tougher than the last challenging ride I went on. It may surprise you to hear that I don’t carry a first aid kit, I often ride incredibly technical terrain alone in remote areas with no phone signal, and I sometimes run out of water before the end of a ride. I’ve thought through the consequences and worst-case scenarios of each of these and I have a plan for every one. I’m not claiming to be especially responsible or anything like that, but its a system that’s working for me so far.